Zendesk is a suite of support apps that helps transform your customer service into agents for IT service management. It can also be used for customer retention and lead source. The suite has one of the most flexible plan structures, making it ideal for business of any size. It consists of customer service, chat, call center solution, and knowledge base modules that you can upgrade separately. Its support plans include the basic versions of chat, call center, and knowledge base, so you get all sides covered right off the bat. This setup affords a startup or small business to implement at once an industry-class help desk. They can easily upgrade to more advanced tools like CSAT surveys, web SDK, IVR phone trees and answer bot as their business requirements get complex. There’s also Zendesk Help Desk app, the Zendesk customer service platform also lets you develop institutional knowledge culled by your support team over the years. The Zendesk Support Guide module helps you build a help center, online community and customer portal. You can direct FAQs and low-touch tickets to this portal, while your agents deal with high-value customers and sales leads. An AI Answered Bot can also direct queries to relevant articles in your base, squeezing out more ROI off your content marketing budget. Zendesk Support is another popular solution from this vendor, which puts all customer interactions in one dynamic, user-friendly interface for an efficient, seamless process. You can bring in customer queries from almost any channel via pre-defined ticket responses, web widgets, and customer search history, allowing you to respond faster and with the right context. The main customer service support module can also be customized to fit your customer service workflows or apps that you’re already using. It also features customer satisfaction ratings and analytics via performance reports and dashboards. This vendor also gives you the option to set up a call center with online, mobile and messaging channels. This is ideal for highly engaged customers or prospects; your agents can quickly connect to them via an automated trigger. Through the integrated live chat, your agents can also proactively engage customers on your website or e-commerce page. You can also use analytics here to make sense of the conversations collected by your call center. As for the Zendesk Live Chat, it is one of the simplest but best ways to engage high-value leads when they land on your website. Studies have shown that customers are three times more likely to buy when they get chat support right when they need it. The chat comes free but can be scaled for unlimited chats, conversation tracking, widget unbranding, and other advanced IM tools. Its latest app to date, Zendesk Message levels up your chat support by engaging customers in their favorite messaging apps. Instead of waiting on your website for prospects to ask questions, this tool allows you to follow them wherever in social media they are mentioning you. This messaging tool integrates with Facebook and Twitter and is available through the Chat module. Overall, Zendesk is a comprehensive and focused help desk suite with all the essentials your support needs that you can scale according to your growth pace: ticketing system, knowledge base, community forums, live chat, and call center. An IT Help Desk edition is also available. Zendesk IT Help Desk is able to streamline the complicated IT service management system because it is designed to treat users as customers also. 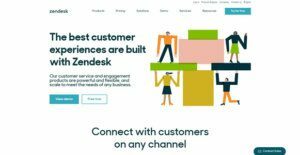 By considering them as “internal customers,” Zendesk IT Help Desk provides an efficient client-focused IT support, coupled with the flexibility and strength of customized analytics and process workflows. This vendor believes that by making the typically complex IT service management process into something simple and scalable to your needs, you concentrate more on other critical tasks like enhancing IT productivity and innovation. Zendesk is a comprehensive suite of support apps that you can scale as your business needs grow. You can treat it as an end-to-end solution, structuring around it a help desk, live chat, knowledge base, call center, and community portal. Or you can start with the main support module and build your support architecture along your budget line. The main customer service support module comes with the Lite version of chat, call center, and knowledge base. You can say you’re getting these add-ons for free so your help desk doesn’t start bare, rather, it rolls out built with industry-class tools. The whole pricing setup of Zendesk lends to your support reliability and scalability, and to your cash flow flexibility. Zendesk Support is a smart solution that is designed primarily for customer support agents. All that they need are integrated into a single, robust customer service interface, making it simple for them to easily manage customer interactions and ensure job productivity. Its support ticketing feature efficiently receives incoming customer queries and instantly creates customer service tickets. It also has integrated analytics and complete audit tracking so you can monitor and generate insightful reports from start to finish, across multiple agents and various channels. Zendesk Support assists a business to deliver personalized, engaging support so that your clients remain satisfied and loyal. Zendesk Support allows you to build a self-service customer portal using its knowledge base and community features. Combined with the AI-powered bot that can direct FAQs and low-touch tickets to the portal, the self-service feature takes repetitive work off your agent’s shoulders, so they can focus on high-value tickets and promising leads. It levels up efficiency in your customer service workflow. Zendesk is more than just a help desk. It crosses over to CRM because it allows you to organize processes, workflows, and tracking of customer engagement. On its own, the software can turn your huge volumes of support data into a treasure trove of leads, opportunities and market insights. Zendesk helps you consolidate these data and leverage them to build or nurture long-term relationships with your customers. To fully leverage CRM, Zendesk integrates with popular solutions such as HubSpot and Zoho CRM. This means the data you collect in Zendesk can be consolidated for further use to develop marketing campaigns and funnel potential new leads into your sales pipeline. Proactive live chat with automated trigger lets you engage prospects who are lingering on your website or checkout page and offer assistance. You have a small window to convert these prospects while they’re interested in your product, and the live chat connects you to them in real time. Moreover, studies have shown that customers are three times more likely to purchase when given chat support in real time — right when they need assistance. Prospects who linger on your product page or checkout page may be confused or having second thoughts; the live chat links you up to these near-to-convert leads at the right moment and lets your support agents, or maybe sales, do the finishing touch. The Zendesk live chat on your website is great at answering queries in real time. But it sits there waiting for prospects to come to you. To complement this setup, the vendor rolls out a messaging tool that allows you to reach out to customers and prospects in their favorite messaging apps. It lets you follow leads wherein social media they are talking about you. Messaging apps are becoming the primary driver for customer service, too, and this tool ensures you got this area covered. Where a complaint or negative comment is lodged on a social media site you can quickly address it before it escalates. Zendesk features an AI-powered bot that you can use in the Guide module. The bot surfaces relevant content in your base as customers type their query. If you have an archive of practical guides and articles sitting unused in your website, they can now add value to your customer service via this bot. That means you’re getting more ROI from your content budget. The software has all the key features you need in a powerful help desk solution. It’s got a ticketing system, knowledge base, community forums, call center, live chat, and messaging tool. You can build an efficient and powerful customer service process around this structure, if not at once, one module at a time. For IT assets, Zendesk offers an ITIL-ready IT Help Desk edition. Likewise, it integrates with important business solutions like CRM, salesforce automation and over 600 apps in its marketplace. Monitoring of company devices like computers, phones, etc. Easy to Use Help Desk Software: Is Zendesk the Top Choice? Since each organization has unique business wants, it is advisable for them to refrain from searching for a one-size-fits-all ideal software solution. Needless to say, it would be futile to try to find such a system even among widely used software platforms. The clever thing to do would be to list the various important aspects that require consideration such as main features, finances, skill levels of workers, company size etc. Then, you should do your groundwork thoroughly. Read some Zendesk reviews and check out each of the other solutions in your shortlist in detail. Such in-depth homework can make sure you discard ill-fitting platforms and zero in on the solution that presents all the aspects you require for business success. We realize that when you make a decision to buy IT Service Management Software it’s important not only to see how experts evaluate it in their reviews, but also to find out if the real people and companies that buy it are actually satisfied with the product. That’s why we’ve created our behavior-based Customer Satisfaction Algorithm™ that gathers customer reviews, comments and Zendesk reviews across a wide range of social media sites. The data is then presented in an easy to digest form showing how many people had positive and negative experience with Zendesk. With that information at hand you should be equipped to make an informed buying decision that you won’t regret. What are Zendesk pricing details? What integrations are available for Zendesk? Pros: I'm the biggest fan of their friendly interface, and I always try to share my impressions with as many people as I can. Take it, and get ready to kick daunting ticket queues out from your computer. I bet you'll be equally satisifed once your layouts become this clean and organized. Cons: I was quite disappointed by a recent change of the ticket information layouts ( Form and Requester sections, to be more precise). It's not like they changed the entire tabs, or reduced their functionality, but to me it was a surprise that took weeks of learning and practicing. Pros: This is wonderful CRM tool for small size businesses, it allows us to keep global inquires well-organized in a timely manner. We are able to reduce the spam and to streamline our processes. I work as customer service and this tool helps me to better interact with customers and to assist them from the very beginning. Cons: The integration with facebook messaging is not great, as soon as we switched to Zendesk we don’t get notification about facebook messages and when we answer from this product it appears as new messages instead of like a response. So we had to turn this notification off. Also, they need to improve the notification to personal email because we don’t get all of them and sometimes I cannot see the customer response in time. What I like most about Zendesk is the ability to navigate between the customers’ supports suites of products from one place and to provide better experience for them. If you need more information about Zendesk or you simply have a question let us know what you need and we’ll forward your request directly to the vendor.